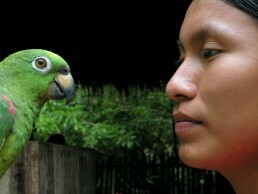 A Quechua Indian from Sarayaku with a parrot, in the Amazon rainforest, Ecuador. In the Amazon rainforest of Ecuador the Indian community of Sarayaku lives in a close relationship with nature and the forest, which it fiercely protects from logging. Legend has it that one day there was a terrible fire in the forest. The terrified animals crouched in fear and helplessly watched the conflagration. Only a tiny hummingbird took any action, flying with a few drops of water in its beak and pouring them on the flames. Pierre Rabhi, farmer, agro-ecologist and French writer of Algerian origin. In 2007, along with several friends he founded the movement Colibris (Hummingbirds), a non-governmental organization whose aim is to build an ecological and humanistic society. Believing that all social change is the result of those made by individuals, the Colibris movement sees initiating individual changes as the most important goal of its mission. It seeks to accomplish this by inspiring, involving and supporting citizens engaged in activities for social change. Linking local groups scattered throughout France in a single network, the Colibris movement enables citizens to undertake practical action in their respective areas.